Anna Barons took part in funiture exhibition Mebel 2009 in Moscow this Novermber, gaining valuable customer and networking experience. 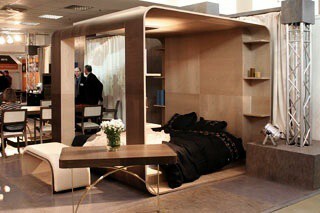 We have returned from the 21st exhibition Mebel 2009 in Moscow from November 23 - 27. Our stand was located in Forum hall, FB100 during a very busy week for the company team. Living Deco furniture collection has won many flattering remarks on its design and quality. Anna Barons stand has welcomed everyone interested in Latvian furniture with Living Deco, Russian Fairytale, Natural Living and New Classic collections. The most popular furniture was Living Deco Master bed with its impressive size; visitors even have asked a permission to make picture of them on this attractive bed.